A sugar-free chocolate pie with a chocolate mousse texture that’s a low carb dieter’s dream. This French silk pie recipe is sophisticated and delicious. French Silk Pie is the epitome of silky chocolate desserts. It’s texture is simply unforgettable. And it’s so easy to make you won’t believe it. It’s one of our favorite pies on the holiday table. Delight your family and friends with this delicious silky sugar free pie. I bet they won’t know it’s low carb! I have to be honest, this is a recipe where a stand mixer is a big help. 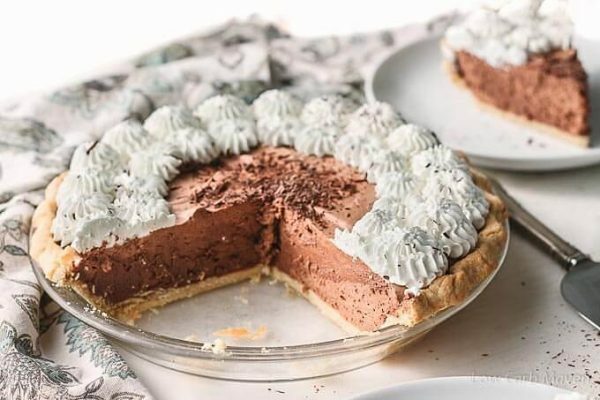 It doesn’t mean that this sugar free chocolate pie can’t be made without stand mixer – a hand mixer will suffice, but it will give the shoulder and arm a good workout. 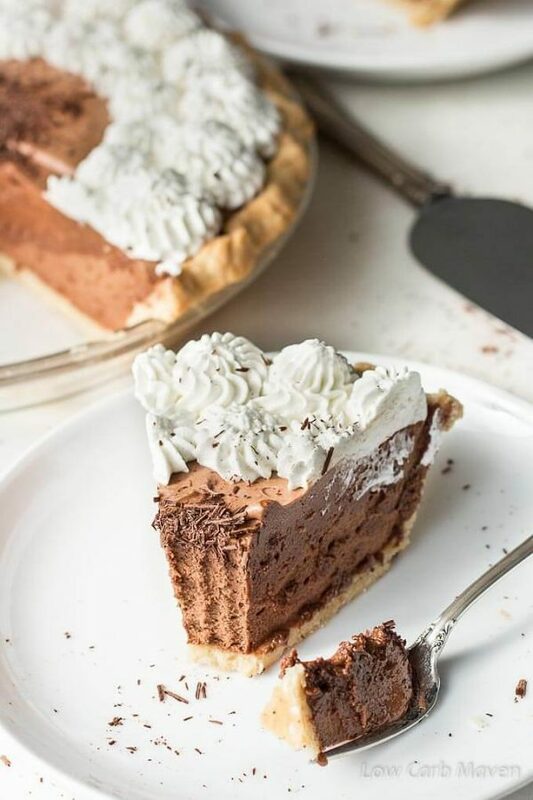 The chocolate silk-like texture of this pie is due to almost constant whisking for 15-20 minutes, and it’s totally worth it! If you’ve spent time looking at recipes for French Silk Pie you will see that many of them call for the use of raw eggs. This recipe is no exception. If you are squeamish about using the raw eggs, use store bought pasteurized eggs. This is the part where I say that recipes containing raw eggs should not be served to pregnant women, the elderly, and very small children. French Silk pie does not hail from France. It is a creation born of Betty Cooper from the good old U.S. of A., in 1951, for a Pillsbury Bake-Off. No one knows why she named it French Silk Pie but it seems fitting since the texture of this pie is so extraordinarily smooth. 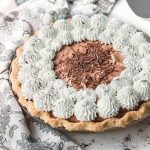 I tested this sugar free chocolate pie version several times with different sweetener combinations and baking techniques to get the smoothest texture possible. Using already powdered sweeteners was the trick. I’m happy to say that this low carb French Silk Pie version is almost as silky as the version we grew-up eating. The trick was using Sukrin Icing Sugar (Sukrin Melis) or Swerve Confectioners Style sweetener, which I generally use in very small quantities. These erythritiol based sweeteners are great and shouldn’t effect blood sugar. So, I’m recommending Sukrin Melis (icing sugar) or Swerve. To take this recipe to the next level, add 1 tsp of espresso powder or 1/2 tsp of coffee extract bring out the chocolate flavor. I like adding 1 tablespoon of brandy! A sugar-free chocolate pie with a chocolate mousse texture that's a low carb dieter's dream. This French silk pie recipe is sophisticated and delicious. Measure the almond flour, oat fiber and salt into the bowl of a food processor. Pulse to combine, Cut the butter into chunks and pulse with the dry ingredients until the butter is the size of small peas. Mix the egg white with the 1 teaspoon of water and pour onto the dry ingredients. Process until the dough just comes together. Refrigerate the dough for 30 minutes or up to 5 days. Roll the pastry between two sheets of plastic wrap until it is the right size for your pie plate. Remove the top piece of plastic and invert the dough over the pie plate. Gently coax the dough into the bottom and the sides of the plate. Remove the plastic and shape the edge. Dock the dough with a fork. Bake the crust for 10 -15 minutes, until it begins to turn a nice golden brown. Let cool completely, then cover with plastic wrap until ready to use. Finely chop the unsweetened baking chocolate and put in a microwaveable bowl. Heat on high 30 seconds at a time until almost melted. The residual heat from the bowl should take care of melting the rest. Put the butter and Sukrin Melis or Swerve in a stand mixer or in a large mixing bowl. Fit the paddle attachment onto the mixer and beat the butter and sweetener on medium speed for about 2 minutes. Scrape the bowl. Add the melted chocolate and mix for 1 minute. Scrape down the bowl thoroughly. Add 1/4 cup of heavy cream, vanilla and stevia glycerite, beating for 2 minutes more. Remove the paddle attachment, and scrape the filling back into the bowl. Add the whisk attachment and turn the stand mixer back on medium speed. Add one egg at a time and let the mixer run for about 3 minutes between each addition, scraping the bowl after the third and forth additions. Spoon the filling into the pie crust and smooth with a spoon or offset spatula. Refrigerate at least 6 hours or overnight, uncovered. Whip the 3/4 cup of heavy cream with your favorite sweetener and top the pie. Additionally, chocolate curls can be added by running a vegetable peeler down the length of a piece of chocolate. 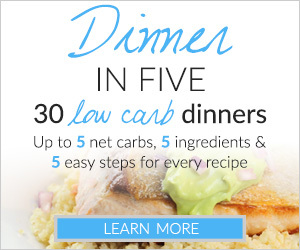 Serves 10 at 3 net carbs each. 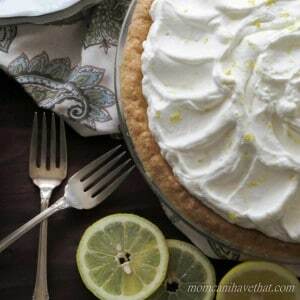 ***I originally used a different pie crust for this pie the first time I shared this recipe one that used protein powder. It's a great press-in pie crust recipe, but I used a different pie crust (my Flaky Pie Crust) when I updated the photos. Use your favorite crust if you wish. Hello! I might have missed it in the directions here… do I put the filling into the crust and then refrigerate to set it? For how long? I made this but accidentally bought oat flour instead of fiber. I used monkfruit sugar (should have used less) and Scharffenberger unsweetened baking chocolate (America’s Test Kitchen recommendation). Everything worked out really well in the end. Instructions were easy to follow. Mine wasn’t as pretty but it was as good as the picture looked! I am ready to invest in a stand mixer after making this pie! Wondering how far in advance this pie can be made and leave in the refrigerator WITHOUT the whipped topping? Hi I made this pie a couple years ago and I really liked the original crust recipe. Where can I find it please? 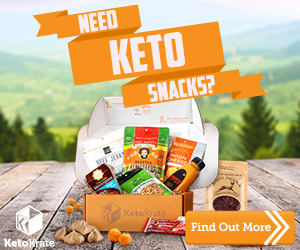 I love this and will make it for Christmas for my non keto family. I’ve not had a keto crust this close to non keto. I will say I didn’t roll the crust out but patted in the pan with no problems. Yumbo! Could you use cocoa powder instead of the baking chocolate squares? How much would you use? THANK YOU for this amazing recipe!!! It’s phenomenal! The crust is perfect!!!! The French silk pie was delicious!! Thank you. I just can’t believe how good it is for a low carb dessert! I wish I could post a picture! Can you just make the filling and put it in cups like a chocolate mousse? How much does the filling make? I make regular French Silk pie and it calls for 8 eggs for a 9 inch pie crust, so this seems like it’s not much. Made this for dessert, French Silk Pie is my husband’s favorite! It was delicious! I’m super excited to make this! I’m craving chocolate pie. I don’t have oat fiber on hand, can i use flax meal as a subsititute?? Is there a substitute for the oat fiber? If I just leave it out, will the recipe work? Thank you! I have to say, your flaky pie crust recipe was AMAZING. I’ve tried so many different low carb pie crusts over the years (since 2012) and they’ve all been pretty unappealing, especially the coconut flour versions. But this crust was perfect! I added a little bit of powdered sweetener to it just because I like my crusts that way and it was just wonderful. Thank you! Amazing! I love this chocolate pie. This sounds amazing! Could I substitute psyllium husk powder for the oat fiber? I’m not familiar with either but recently purchased the psyllium for a different recipe. This looks wonderful, but before I try it will powdered erythritol work? It has that cooling effect and I don’t know if the two sweeteners you mentioned do or not. I will certainly wait to get them if they don’t. Thanks so much for your recipes! Where do you find Oat Fiber?? I can only purchase it online apparently. What is a substitute?? So a year later I remade this pie crust as written and the oat fiber makes a HUGE difference! I ordered it off Amazon and trust me, its worth it. Your pie recipes are amazing! This pie looks too good to be allowed! 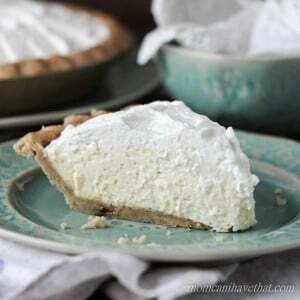 I saw a classic recipe for it just yesterday (I don’t think I have heard of this pie before and now twice in two days) and now I am so craving it!!! Kim, how many days in advance could I make this pie for Thanksgiving? By the way, almost my entire Thanksgiving menu is comprised of your recipes! Thanks so much! This pie is amazing! I made 2 for a family picnic over the weekend. I modified some ingredient quantities a bit for the crust and used puyre sweetener that I ground in coffee grinder because that is what I had. My reccommendation is to let the pie definitely sit overnight. Don’t get me wrong, it was delicious the day I made it, but it was out of this world amazing the second day! Thank you, thank you for all your hard work. 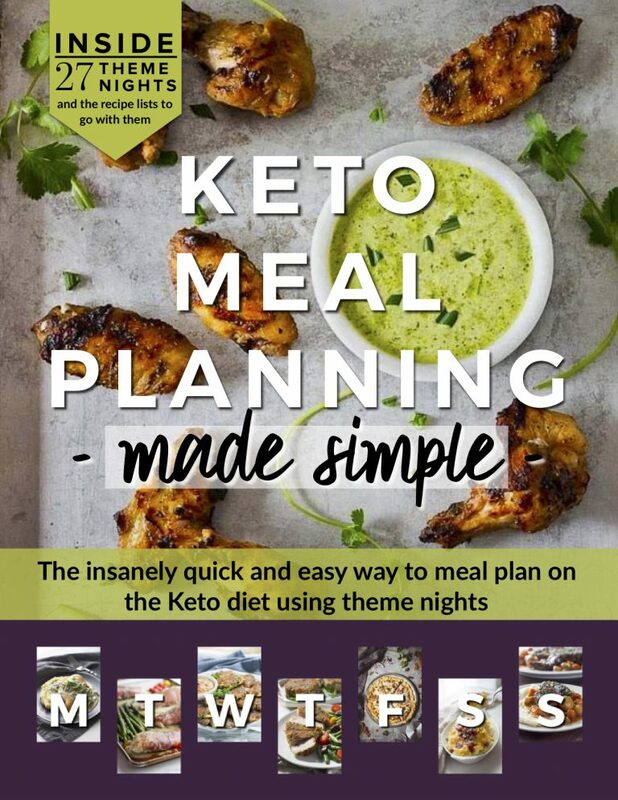 I have so loved my 9 month journey of the keto lifestyle because of people like you creating recipes like this one! Is that I don’t want to buy a big thing of the Isopure protein powder. Protein powder and it maintain the consistency ? I am looking forward to making this as I am a French Silk lover but have since gone Keto. I am not a fan of walnuts (only nut I really do not like) so I wanted to know if the walnut flavor is noticeable in the crust recipe or if there are alternative nut options you would recommend? Thanks! What the heck are pasteurised eggs?? Should this be pasture raised eggs??? This pie looks absolutely delicious! French Silk pie was my favorite treat before starting this healthier way of eating. I can’t wait to make this!!! Kim, thank you so much for this recipe! I made this today and it was turning out GREAT…the only problem was when I added my third egg. The mixture separated and was no longer fluffy and delicious like it was with two eggs. A friend of mine who’s great at baking said it could be an issue with the powdered erythritol I used, saying that that’s what would help balance out the heaviness of the butter. Then I realized I only used 3/4 cup because I also don’t like my keto desserts over-sweet and mouth-burny…so I’m guessing that was juuuust enough for two eggs but the third wasn’t having it. I will remake it later with two eggs and hoping it’s just as good as it was before that naughty third egg! P.S…I had a lot of trouble with the pasteurized eggs–I tried doing it myself (twice) and accidentally cooked my eggs (twice). :/ So then I bought pasteurized eggs, but could only find egg beaters pasteurized egg whites…but no worries, they DO work just fine, so if that’s all you can find, no worries! Hope this helps anyone having trouble like I was! Thanks, Kim! Oh-no, Donna! I’m so sorry your pie filling broke. Erythritol gets cold as it melts so perhaps temperature was an issue, too. Sugar, like gluten, has some magical baking properties that sometimes can’t be duplicated with low carb ingredients. I have a ‘thing’ about raw eggs..they creep me out.. can anyone help? not get over my fear or therapy but perhaps a substitute? I Need to make this. 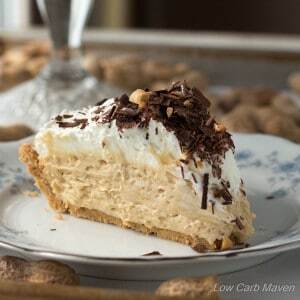 French Silk Pie is one of my Favorites. What is a substitute for the protein powder? I only have chocolate right now and I think it would affect the taste of the crust in a bad way. I so want to try this recipe! Oh. My. God. 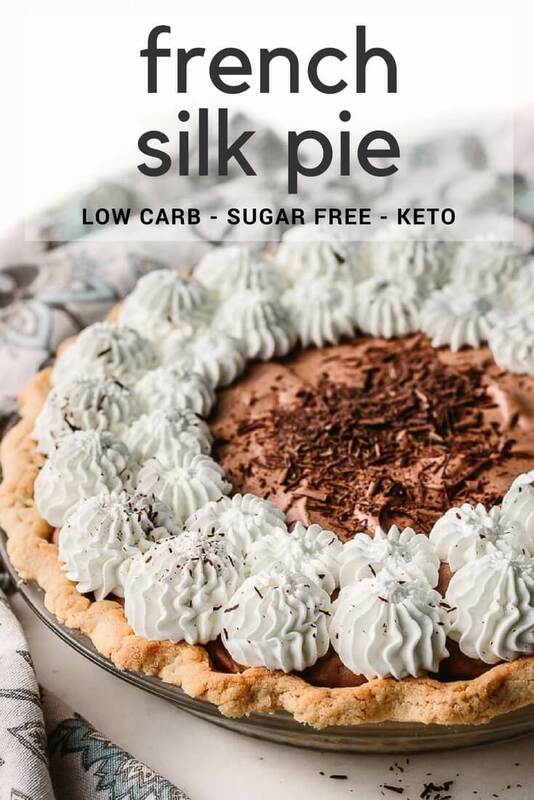 This is hands down the best low-carb chocolate silk pie I have ever tried. The crust by itself was so good I could have just eaten that. I did use Splenda, as I don’t care for erythritol, but I can afford the few extra carbs. I also used 4oz of chocolate instead of 3.5 as that is a standard size bar. I used a hand mixer but the effort was worth it for the divine texture. Next time I will try making it in individual ramekins. Thanks for the great recipe! Hi Kim. You mentioned you don’t like the taste of erythritol… I must not either. I made this pie last night & added the 1 1/4c of swerve. Yikes! It is so sweet, it burns my mouth and has a menthol effect. Otherwise, love the crust, love the texture, taste is great. How much can I reduce that swerve or what else could I use instead? I just did it with adjustment of ingredient here and there but it still turn out greattttt. My adjustment was coconut flour instead of almond and use only half of almond flour, coconut whipped cream instead of heavy cream, only egg yoke instead of whole egg. It’s easier than I thought and it is so nice. Thanks for the recipe. Next time I’ll try some main dish from your recipe ? 6 Oz is not 1 1/2 sticks. Which do I use? Oops! I was reading oz and thinking Tablespoons! Sorry. Thanks for clearing it up for me, though. I have the crust made and everything else ready to go. I can’t wait to taste it! I cannot have whey. Is there a substitute? Hi Diana, use your favorite protein powder. Looks wonderful! Can I sub a different protein powder I already have on hand? This looks amazing! I really want to make it for Thanksgiving. Can I substitute another brand of protein powder for the kind you use? I really don’t want to buy any more protein powder:) Thanks! Kim this looks heavenly! I dont own a stand up mixer, I have a simple hand held mixer, is it possible to make this recipe without a paddle attachment? 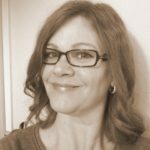 Thanks for sharing such amazing recipes! This was the best thing I have ever had! I made it the night before our party and oh my god heaven! This used to be my favorite pie back in the day before I went low carb and I’m so excited to have a recipe now I can make forever! Thank you! The only issue I had was that the crust crumbled a lot when we tried to cut it but it still tasted great nonetheless. Not sure what happened there but I’ll keep trying – this is a keeper!!! The only thing I can say about the crust is that it needs to be really firmly pressed into that pie plate. I use a flat bottomed glass for the bottom and the sides, then take my time around the edge. If the mixture doesn’t hold together when you squeeze it, add a little more butter or a little water (maybe 1 tablespoon). Sometimes it takes a couple of times to get the feel of a recipe. So the eggs are not cooked? Terrific pie! 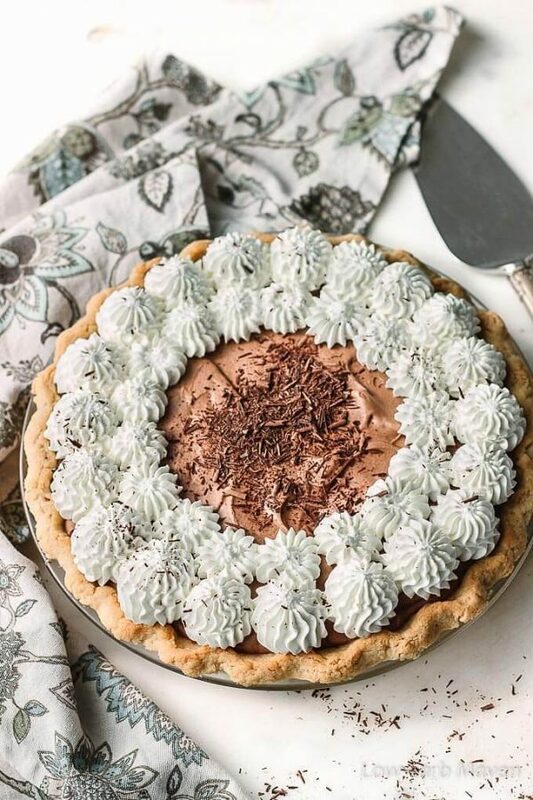 I’ve been searching for a good chocolate cream pie and this may just be the one. Pinning and sharing! What is stevia glycerite ? Pie looks terrific! Great question Pam! It is a concentrated stevia based sweetener that is less bitter than other stevia sweeteners. It is a viscous liquid and easy to measure. I do not like the taste of erythritol so I usually reduce the amount of erythritol in a recipe and make up the sweetness with stevia glycerite. I buy mine through Amazon.